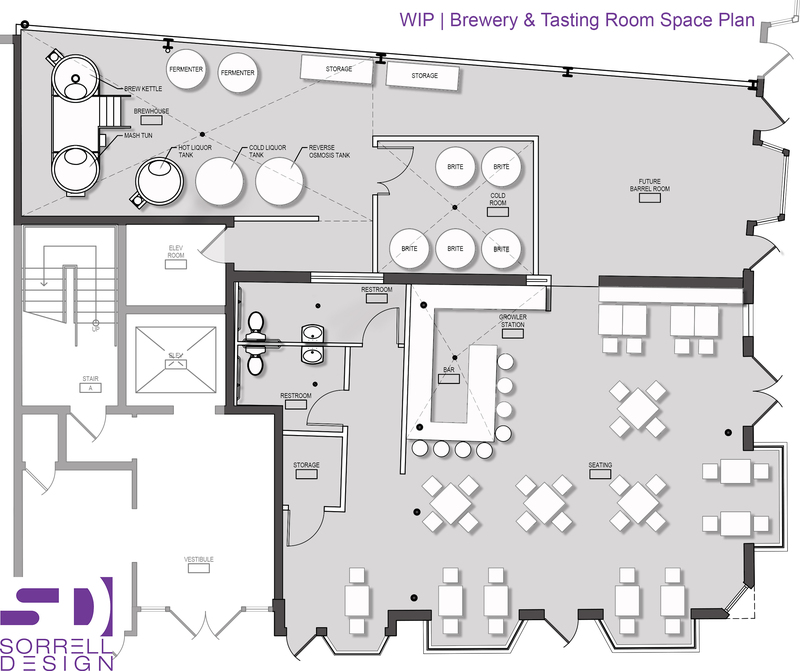 Sorrell Design (SD) is working a brewery in planning that is examining potential spaces that will suit their needs. Even in these early stages, SD was able to provide assistance in budgeting, scheduling, and space planning. We are sharing this Work In Progress (WIP) to provide insight on our process. There is a large concrete partition bisecting the space. We were able to embrace this separation, utilizing one area as the public space and the other for production. The larger space would become the tasting room, with a bar centralized and located across from the main entry. This allows the bar tender to greet incoming patrons as well as access to the future barrel room. Surrounding the bar are tables and seating. At one end of the bar is a growler filling station. The restrooms were located in the back of the tasting room to allow for the area to be more open. In addition there is existing plumbing in the area, minimizing construction costs. A storage room was also provided to allow for easy stocking of the bar and restrooms. The remaining space is for production and a future barrel room. Initial thoughts were to showcase the brewing or fermentation equipment at the windows, however existing conditions dictated that this would be costly. The front portion became the future barrel room, and is separated from the brewing area by a cold room that houses the serving tanks. The cold room was located on the other side of the bar to allow for a direct draft system. Once the plan was finalized, we worked with a general contractor on preliminary pricing so that our client would have a realistic budget based on the building and design. We are currently reviewing the budget, space plan, and equipment to determine the best way to move forward.